Welcome to the historic Old Mill Inn, a former gristmill completed around 1820. Today, the Old Mill Inn is proud to be part of the North Fork’s living history, featuring fresh local produce and Long Island wines and beers. 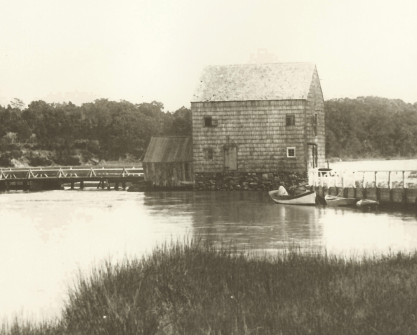 Upon returning from the War of 1812, Samuel Cox constructed a tidal mill on Mattituck Inlet. The mechanism was able to harness both incoming and outgoing tides, and was considered to be a feat of engineering in its day. The millstone still exists on a corner of the building, and the driveshaft still stands as a pillar in the pub. By the turn of the century, the East End had become a destination spot for travelers and tourists, and so the gristmill was sold for a mere $300 to Yetter and Moore, a bottling company in Riverhead, and converted into a popular tavern. One satisfied customer was quoted as saying, So much for the grist mill,…it will now be known as a gin mill! During Prohibition the proximity of the Mattituck inlet to Manhattan made the creek a popular drop-off spot for rumrunners, and tales of bootlegging in the area are legend. There is still a drop door near the kitchen of the Old Mil that allowed boats to readily transfer “hooch” during low tides. With the completion of the Long Island Railroad, Mattituck grew as a tourist destination. Hotels and rooming houses flourished in and around Mattituck, and the Old Mill enticed vacationers with “Dining and Dancing” on the water. Ye Old Mill was also, not surprisingly, a romantic hideout for certain celebrities…. There are reports that a New York film studio regularly protected Clark Gable and Carole Lombard whenever they would escape to the Old Mill, seeking privacy… and of course, booze. In 1939 George Naugles opened the restaurant and bar, with Mr. and Mrs. Bert Lipton, of the Savoy Plaza Hotel in New York. Manager Otto Magdefrau encouraged patrons to carve their names on the beams and sides (still visible in the pub today), and amused clientele with his collection of exotic animals. Pictures still exist of the beer-drinking monkey who lived the water tower across the street. Mr and Mrs. Richard Holmes took over in 1958, and with headwaiter James Primus, ran the place for nearly two decades. Many of our customers fondly reminisce about their first summer jobs here, learning their ropes as bussers or dishwashers under the couple’s benign employ. Mrs. Holmes stills cuts quite a figure at The Old Mill. Though many years deceased, she continues to keep her hand in: the ice-scoop has been known to fly across the kitchen, trays move, and more than a few patrons have felt her cool (and sometimes flirtatious) presence as they cozy up to the bar. Since the eighties, David Bascola, David “Rosie” Rosenberg, Bruce Acker, Walter Stockton and Jerry Daly owned the Old Mill. Committed to reviving its history while bringing great food and drink to the Inn, old friends Elaine Lafferty, a former Time magazine reporter and war correspondent, Barbara Pepe, a television executive, and Bia Lowe, author, became the owners in 2006. Elaine and Barbara have since moved onto other projects…but Bia still has her nose to the grindstone! Bia and her team of dedicated servers have one goal in mind: to bring you a wonderful dining experience in our waterfront restaurant, and a fun time in our pub, whether enjoying live music or cozying up to the fire. Dock your boat, or hitch your wagon, and listen carefully for Mrs. Holmes… Because history is alive here and we welcome you to join in.